A kitsch living room bar now back in Deptford for good. Remember when Pat Butcher came back from the dead? 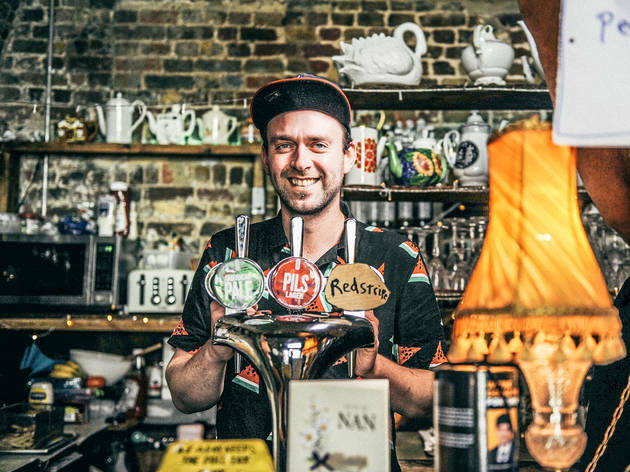 The homecoming of Little Nan’s Bar to Deptford – it originally opened in 2013 and was forced to close in 2014 – feels just as euphoric. The ‘EastEnders’ analogy will make sense to those who experienced the pure joy of visiting the bar in pop-up form, as it roamed around London waiting to find a way back to Deptford. It’s a retro living room parody in a railway arch at Deptford Market Yard, with leopard print, china and Pat references aplenty. The little nan in question belongs to Tristan Scutt, who refers to himself as the grandson of this operation. He set up the bar in honour of his late grandmother (who made it to 104), and has been very clear that while it’s all vintage, there’s nothing ‘shabby chic’. Instead, it’s full-throttle ’80s front room fetishism, with cocktail menus hidden inside Charles and Diana memorabilia books, mocktails served in leopard-print mugs, soap stars in photo frames and cat-covered cushions galore. You can order cocktails by the teapot, or go solo and get a cocktail umbrella in the bargain. The drinks are on the sweeter, sillier end of the scale, my Chief Girl of Deptford being a bubbly mix of gin, prosecco, lemon and Morello cherry syrup, which tasted a bit like a boozy cherry Vimto. Snacks are true Brits – from a cracking fish-finger sarnie to hoops on toast if you’re into nostalgia. They even stuck sparklers in our portion of hipster fries (dusted with paprika). If you’re trying to make sense of it all, you’re missing the point. Little Nan’s is about fun, from the novelty toilet (I’ll save that surprise) to the storming disco soundtrack. In that joyous, totes emosh ’Enders scene, Pat’s spectre says to Peggy, ‘I think I look smashing.’ Little Nan, you look smashing, too. Little Nan's Bar is the most unique and inviting bar/restaurant I have stumbled across in London for a long while. I have only recently moved to the Greenwich/Deptford area and am impressed by the big changes already seen because of the newly opened developments under the railway arches of the train station that make up the Deptford Market Yard. And situated right in the corner by the entrance is Little Nan's Bar itself. The bar is a treasure trove of all things I would relate to a visit to my own Nanna's from Queen Mother book covered menus, to simple yet hefty meals (like chip butties) to that warm and secure comforting feeling you always get when you pop in. Add to that a splash of London blood in the form of a Pat and Frank Butcher-enshrined leopard print commode, and you have got yourself a fun and incredibly inviting little pearl of a place. Ever in the area, make sure you stop by. You won't regret it! P.S. Make sure you order a portion of the camembert-baked onion rings; a ravishing heart attack ready to happen that you just can't put down! Over the top kitch decor is one thing but you will also be served cocktails in your grannies favourite novelty china teapot! 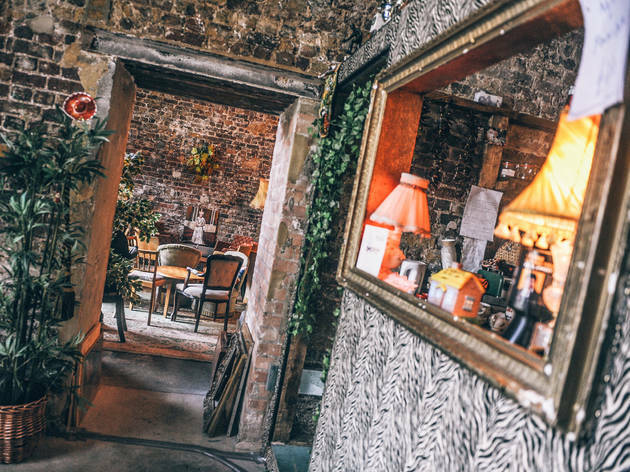 Get ridiculous and escape the rigid norm at one of these original and quirky venues. We also hired for a birthday which was great. Party time! Little Nan's creates a great 'home away from home' atmosphere with sofa's loungers and bar chairs scattered about. In conjunction to the fantastic tacky decor they have cheesy tea pots and mugs to match. 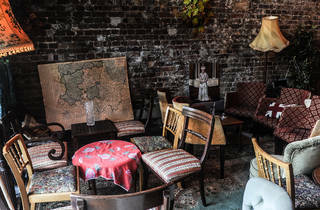 I love the vibe of this bar and how relaxing it is to sit down on a sofa with a teacup of cocktail in the middle of Deptford. The staff were very helpful with my booking and I would love to join them for a 'tea' again. Not worth it for afternoon tea. All food is store-bought from the nearby supermarket. What a brilliant, quirky bar! My only gripe is that it is so far away and it's a bit of an effort to get there for me. The drinks are fabulous and clearly a lot of thought has gone into the menu - it's very extensive and you are tempted by them all! The staff were fab and very helpful. The little details with the decor are great and you can't help but be in awe of this place. Conveniently located right under Deptford Train Station, Little Nans Bar is every hoarders dream. It's cosy nature resembles Nans living room; busy and homely. I came for the teapot cocktails, yes I said it TEAPOT Cocktails. A bit like jugs of cocktails but served in fancy teapots and extremely discreet. I'm a cognac, whisky ginger type of lady and anything infused with all the above generally tickle my fancy. It was no surprise the Frank Butcher was my choice of drink. A perfect refresher and severed generously, definitely for sharing. 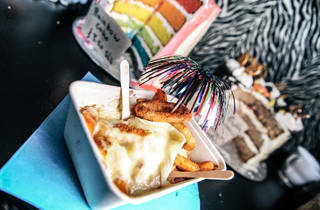 I scanned through the menu and went for the Deptford Disco Fries, I fancied a mini carb fest so it was only right. Pretty much Potatoes, chips, cheese, cheese again and more cheese. The fries are shaken in disco dust (some sort of spicing and topped in all sorts of cheeses) I would have enjoyed the chips more with just dust and a little cheese, as after a few mouthfuls I couldn't handle any more. The mugs of chicken nuggets were yummy and served generously! 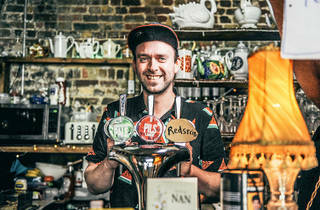 Little Nan's Bar screams kitsch, quirkiness & weirdness from miles! Situated really nicely in wonderful Deptford Market Yard it is definitely not your ordinary cocktail bar. The place is quite small, the cocktails are served in huge teapots (about 4 servings per teapot) and are meant to be enjoyed in teacups. You choose your own teacup from a selection hanging by the window. The cocktails are good but do not come here expecting classics. I found it very hard to decide, as I don't like sweet cocktails and most of the choices were a bit too much - too many ingredients, syrups and juices made up the majority on the very messy and hard to read menu. The atmosphere is nice and the quirky decor offers too much to look at. I think it's a good bar/cocktail lounge to know, but I still haven't made up my mind in regards to what occasion you would go here for. It's definitely not the place to start a night out, but it might just be the local place to go to for a midweek cocktail and catch-up with a friend. The decor, the drinks and the disco chip buttys - this place has it all! 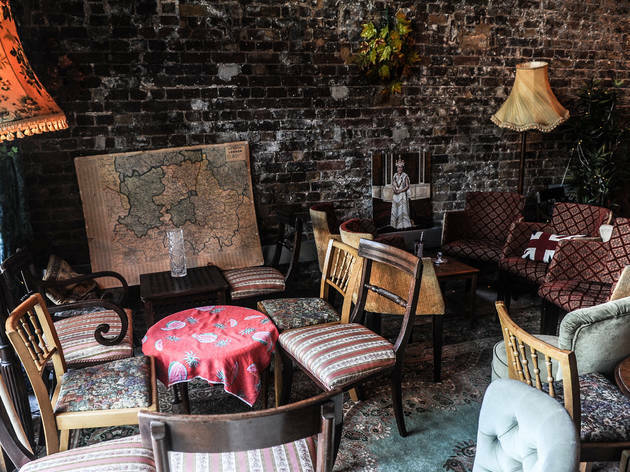 Like sitting in your gran's front room, this cosy little venue is conveniently located moments from Deptford station, making it an ideal pit-stop on your journey. With a huge selection of cocktails, the biggest problem you'll have is deciding what to try first! Excellent location! 10 minutes by train from Cannon Street, and no my North London friends, no passport is needed! Literally situated outside Deptford station in the arches. Lovely atmosphere, great Eastenders Nan feel. The cocktail teapots are amazing. Strong, well made, delicious and 100% cocktail. Choose your teacup off the window hanging and off you go. The food was carby, comfy, and tasty. The menu is very overwhelming and ridiculously hard to read even though it's quirky fun. Our service was awful, and several of us didn't get what we ordered. But the waiter was friendly and mistakes happen. It is very tiny inside, maybe room for 10 tables, but when warmer weather prevails there is a lot of outside seating. Nice place for a cozy drink after work! If you are brave enough and have some adventure in your soul, venture that bit further into the Deep South and try the Catford branch, not enough stars in the sky to rate that one!! Wow... What a wild experience this was. I can honestly say I've never been to a bar quite like this... It was themed around your typical British Nan's home but honestly I don't think I got that feeling at all. It felt more like a car boot sale themed bar but honestly dont let that deter you! The cocktails are delicious!!!!!! I'm always skeptical when it comes to teapot cocktails..... They usually put 70% ice and 30% cocktail but not this spot!!! The cocktails were strong and well made! Though the menu is super hard to read .. You must preserve!! 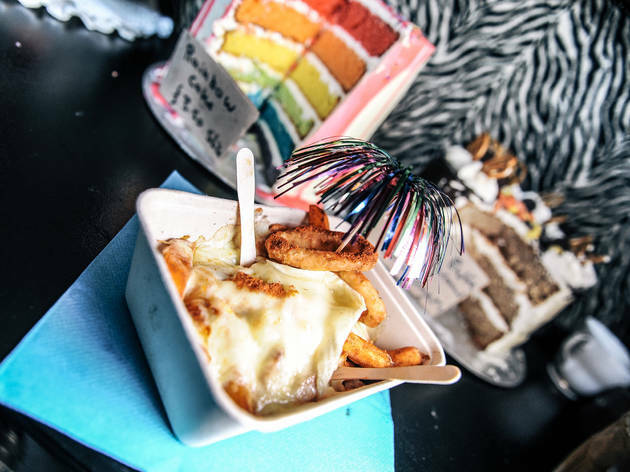 They're dishing out British classics such as fish butties and disco fries! All very flavoursome I must admit and all very reasonably priced. I'd go as far as saying veryyyyy reasonably priced. If you're in the area and in the mood for something weird but wonderful..... This is the place for you! I can safely say I have never been anywhere quite like it - quirky atmosphere, tea pots of cocktails and food just like your nan made it. There's something hear warming and sweet about this place. The humour and Eastenders puns in the menu must be lost on many people but my nan was a HUGE fan so it all made sense and took me back to a happier place. The cocktails are amazing with a huge array and a very well stocked bar. The food was amazing but extremely unhealthy. Get down there before it becomes a tourist trap. Amazing decor in this unusual cocktail bar in Deptford. I probably would have never been till Deptford if I wasn't invited to join friends there and it would have been a shame to miss this place. We ordered teapots. They are supposedly filling 4 teacups but there was enough for 5 or 6 cups so everyone could try the cocktails. The cups are hanged a bit all around the room, so you just have to grab one to start enjoying! My preference goes for the "I love Boney M" and the "Pornstar"; they are really fresh and fruity, really easy to drink. It was a shame the weather wasn't on our side because the venue has a really nice space outside. If you are in this area of the town I definitely recommend you give it a try! Really disappointed because my mum was really looking forward to showing my sister and her kids this place and new shiny Deptford.... Unfortunately despite having liaised with them for a week, I was contacted on Friday night that they couldn't provide the gluten free afternoon tea we wanted :( to add to this disappointment, it was too late to book anywhere else.. so for her special 75th birthday we had our own gf tea party for a fraction of the price courtesy of Sainsburys! Cute and kitsch OTT bar, really fun place to take people for the first time! I always pop in here with newbies to Londom or visitors if you can get down on a weeknight you are likely to get a nice comfy corner to nestle in and really soak up the atmosphere. Its fun and obviously a labour of love from the owners, every tiny nook has a silly detail thats great to focus on when you have had ten too many of their teapot cocktails. Would be a perfect venue to take a girly group or even your family, lots of nostalgia throw backs to laugh about and treasures from our childhoods that will have you welling up. The drinks are on the expensive side but also strong. Start the night here and move on if you're on a budget, still worth the visit! 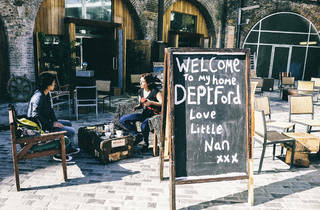 Little Nan's has finally returned to it's spiritual home of Deptford as it joins some of London's brightest and best traders under the arches in recently opened Deptford Market Yard. Little Nan's is to the yard what the Queen Vic is to Albert Square. It's kitsch; it's a place to go overboard on the drama; it's a place to meet friends and have a drink; it's also got a legend of a landlord. The only thing that makes it better is the range and quality of the drinks. However, this establishment is not a pub; it's most definitely a cocktail bar. The extensive drinks menu boasts a variety of concoctions both long and short, made from a a large range of different spirits. [add what I had here]. If nothing tickles your fancy, they also have beer bottles and on tap, as well as wine. This place is the most excitingly kitsch place I think I have ever visited. I was tempted into trekking to Deptford to check it out after reading another TO review, and I have to say the experience didn’t disappoint. The place is decked out like a living room from the 80s, complete with vintage cushions and furniture your Grandparents probably owned 30 years ago. The menus are hidden within books about the Royal family and retro photographs are scattered around the room. As an avid ‘Enders fan for many years, the many references to Pat Butcher were also not lost on me.. from the leopard print toilet to the over-sized comedy glasses! My personal favourite part is the tea pot cocktails (complete with cherry syrup for added nostalgia) served with a bone china tea cup and a cocktail umbrella for good measure! The food is amazing. Make sure you try the delicious fish finger butties and camembert baked onion rings (served with a sparkly surprise!) The music is pure disco classics, perfect for getting your 80s groove on! Absolutely 100% fabulous! 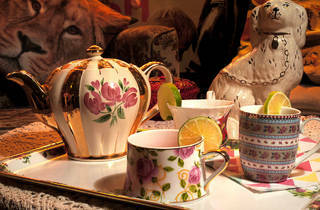 Wonderfully quirky, with brilliant cocktails that can be served in a vintage teapot and teacup set. Retro tunes and grandma's furniture really completes the look nicely. Best bar! So much fun!!!! Such fun and so friendly. If you want to step back into the nineties and drink rum from a teapot whilst riding a rocking horse in comedy glasses (and who doesn't) this is your place. Perfect for an event or something a bit different! Conveniently located next to Deptford Rail Station, it's an escape from the business of central London. Cute, kitsch decor with quirky cocktails and a strong theme emanating throughout. Excellent staff who really care about what they're doing and there's always a great and diverse crowd of patrons throughout. Grandson Tristan makes the best cocktails! It is such a cosy and friendly place. I've visited all the little nan's pop up's so it's great they finally have a permanent home. This place is great, so welcoming and fun. I highly recommend it! So much fun, great value & the owner Tristan is the best! This place is still somewhat of a hidden gem... echoing what everyone else has already said! 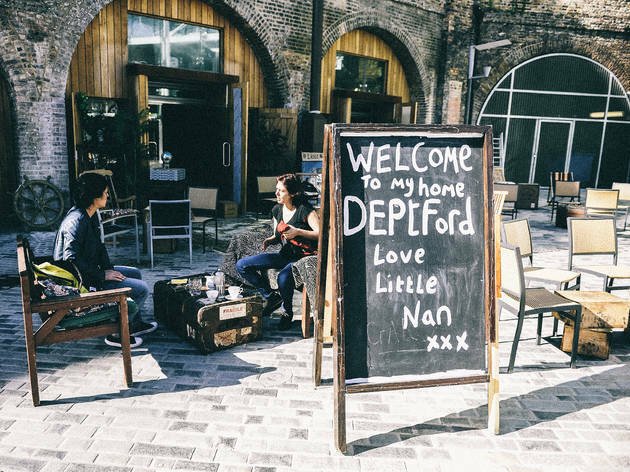 But it's true, even though Little Nan's has moved from Deptford to Lewisham to New Cross and now back to Deptford, it remains just as amazing as the first time I stepped foot in it. It's got a quintessential British feel, but with heaps of quirkiness which is truly unrivaled. The cocktails in tea pots is adorable. None of the crockery matches, but that's the charm of this place. All I can say is you're in for a real treat if you're planning on visiting! One of the gems in the new Deptford Market Yard. Love this place. Great place, great people, so happy it's in Deptford! We took 10 miniature spirits - which I don't think impressed the waiter however for us it was great. Little Nan's has travelled round south London & is currently residing in Shoreditch but hopefully she'll be back south soon enough (where she belongs!) This is the perfect chilled, not pretentious, fun and afforable cocktail bar. If you don't like the royal family, soaps or '90s politicians then this place isn't for you! Searching for a cool venue to shoot Poplin Pyjamas - Little Nan's Bar became our first choice. We were so pleased that Tristan managed to fit us in and we couldn't have been happier with the finished pictures. This is an absolute gem of a venue. So unique. Very cool, friendly staff. Excellent and reasonbable prices for cocktails with regular specials. Superior munchies . Excellent personal touches such as inventing a cocktail for a friends birthday. And bonus free earrings. What's not to love?! This place has it all. From the minute you slope off the main drag, it's an awe inspiring trip off bizarrely juxtaposed 90s pop references and bad polyester. You'll probably need a stiff drink just to get over the excitement, which is great because nan's got the lot. Curious cocktails served in kitsch crockery and pleasing wealth of ale, cider and beer. Top notch. Drag your friends along and earn serious brownie points for having found somewhere so genuinely fun and original. And if you really want to make a night of it there's a great little club just next door! My grandma's home away from home. I love coming to this place with my mate's. The staff are friendly the interiors have a real vintage look of your grandma's living room. The Queen Victoria has got to be my favourite cocktail with a slice of millionaire shortbread, although the shortbread has been sold out due to high demand. Wouldn't think it would be as busy during the summer but when the weather changes in a few weeks I have a feeling it will become the #1 hangout. Calling this bar a 'hidden gem' sounds like a cliché but there is nothing clchéd or unoriginal about this bar. Quirkily themed to look like your Nan's living room and staffed by super-friendly people, this is one of my favourite bars in South London. 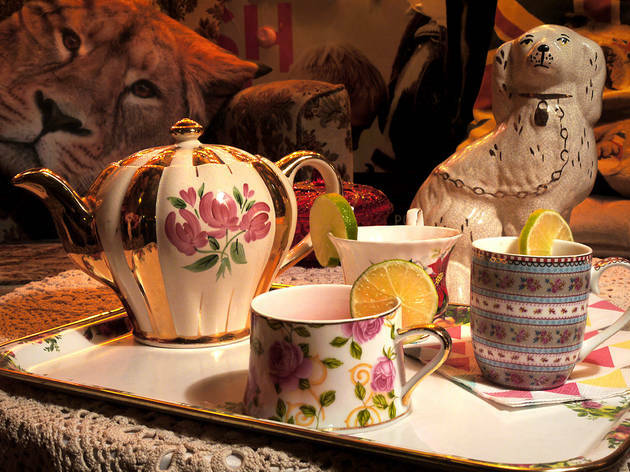 You can have cocktails in teapots and your G&T in a Royal mug - you can even get a cocktail invented and named for you for your special occasion. Try the Werther's Original Vodka...just like your grandad used to give you...;-) It's as if your Nan's living room as you remember it when you were 5 years old, suddenly contains all the things you wished it had when you were 18 years old. If you're in Deptford, you should go. If you're not in Deptford, you should go. This place is an absolute gem! 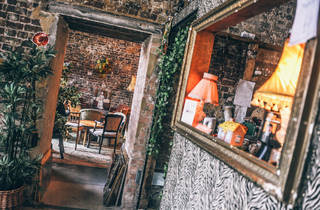 Instantly inviting and full to the brim with character - the ceiling is a checkerboard of lush fabrics and the fantastic cocktails are served through gilt picture frames! This is a bar where everyone is genuinely welcome, and is fast becoming the worst kept secret in London! The drinks are an absolute bargain and the homemade snacks are brilliant to soak them all up with. The owner's 'little nan' would be proud! This is my 'happy' place... never leave disappointed! From teacup cocktails, to half pints in Jedward mugs this place has everything! Wigs in chests of drawers, cheese straws which quite frankly are amazing and it always has incredibly happy clientele! The Paddy Ashdown is my favourite cocktail, and definitely try Nan's famous Werthers Original Vodka! It packs a punch! I will be spending my 30th birthday celebrating here and cannot wait! Get yourselves down for an amazing night... yet to meet Nan but I hear she is a gem! A fantastic little bar, brimming with atmosphere and clever little ideas. Perhaps a little out of the way, but it's really nice once you're there. Love Little Nan's Bar! Like nothing I've ever seen before, it's like stepping into another world! So happy that it's no longer a pop up and has been made a permanent fixture in good old Deptford. LOVE the Paddy Ashdown and Sir Francis Drake cocktails. The Lady Pat Butcher always goes down a treat too, each one is served with a little surprise. Always a friendly, welcoming atmosphere and the drinks come at purse friendly prices. Free shots of candy flavoured vodka for tagging in is a winner and the cheese straws are a must. Vintage lovers should deffo check out the monthly market, with most goods costing under a tenner, bargains galore!